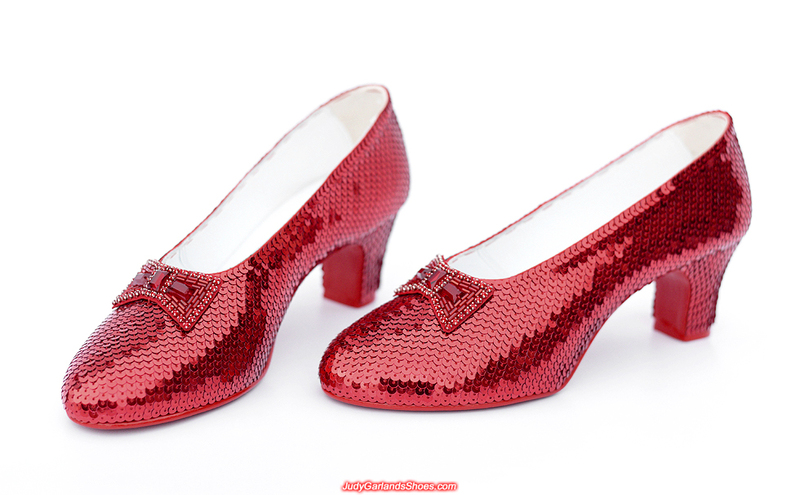 We are crafting a pair of wearable hand-sewn ruby slippers in December, 2018 for a lovely lady in the United States of America. This will be our final pair of ruby slippers for this year. 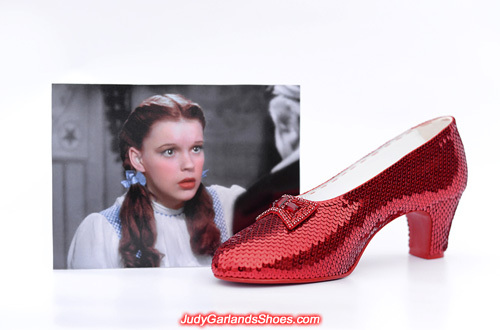 This pair of ruby slippers will be made into a US women's size 8.5 to look in pristine condition as worn by teen superstar Judy Garland as Dorothy on the set of The Wizard of Oz. 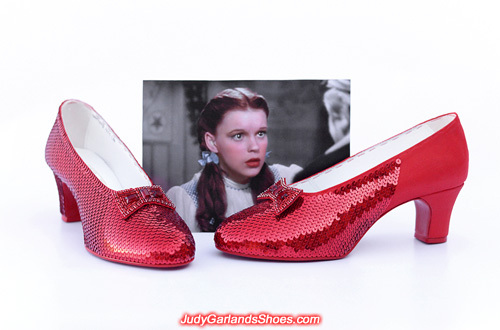 The difference is the gorgeous brunette wore a smaller size 5 ruby slippers in the movie. We have a beautiful pair of hand-sewn leather and silk fabric bows made from the same stones and beads found on the original bows. 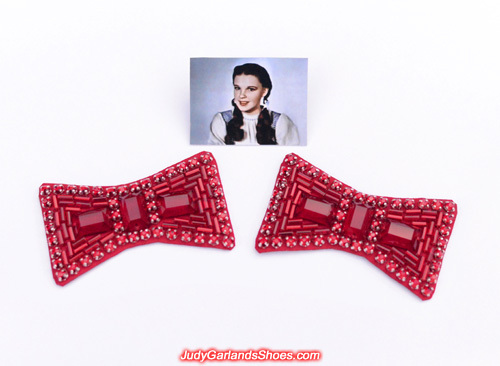 This pair of bows are a bit bigger than the original bows and they will be sewn on top of the size 8.5 ruby slippers. 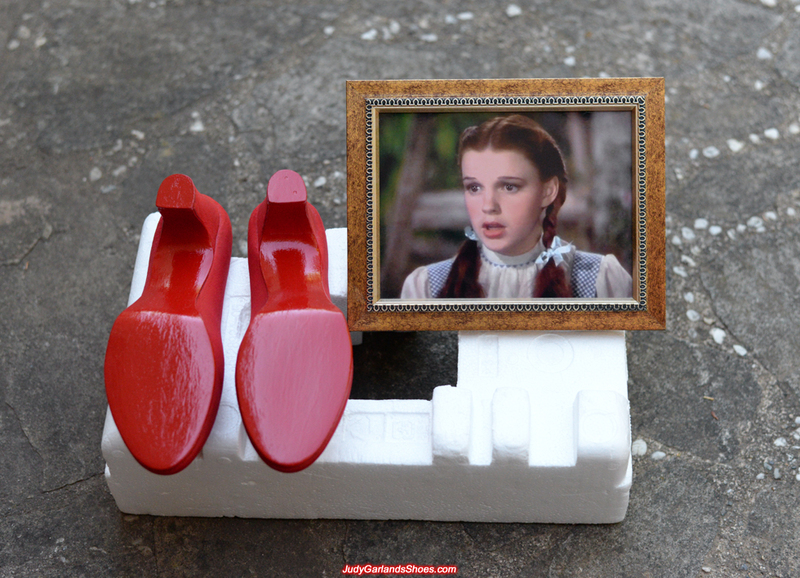 Our women's size 8.5 pair of shoes is finished but first we want to show the soles alongside an innocent Judy Garland as Dorothy. 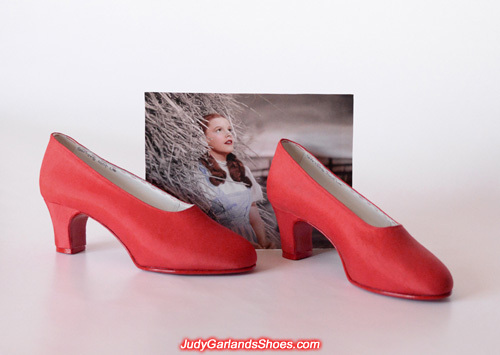 Our pair of American ladies size 8.5 shoes is finished but there's still a lot of work ahead. These wearable shoes is made by hand including the accurately cut wooden heels to match the original 1930's style shape of the ruby slippers worn by Judy Garland as Dorothy. A golden embossed label is stamped inside the right shoe which reads "Innes Shoe Co., Los Angeles, Pasadena, Hollywood" and the tag "#7 Judy Garland" is written along the top of both shoe. These are MGM quality shoes that can be worn just like in The Wizard of Oz movie, so they are not limited for just display. 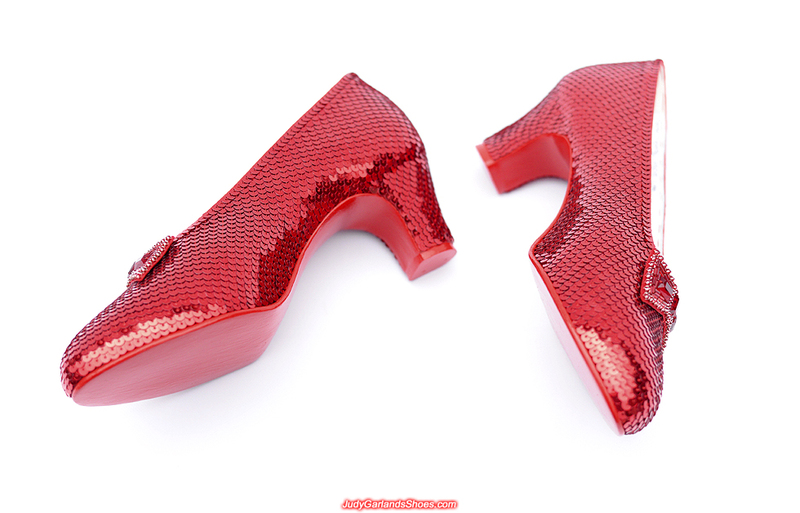 Thousands of sequins will be tediously sewn by hand to transform our beautiful mid-heeled pumps into a pair of high quality ruby slippers. 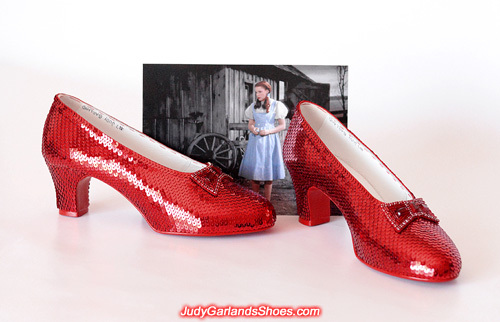 These size 8.5 ruby slippers will look in new condition. Sequining this big size 8.5 women's US shoes is slow as you can imagine but the right shoe is looking very exquisite and neat. 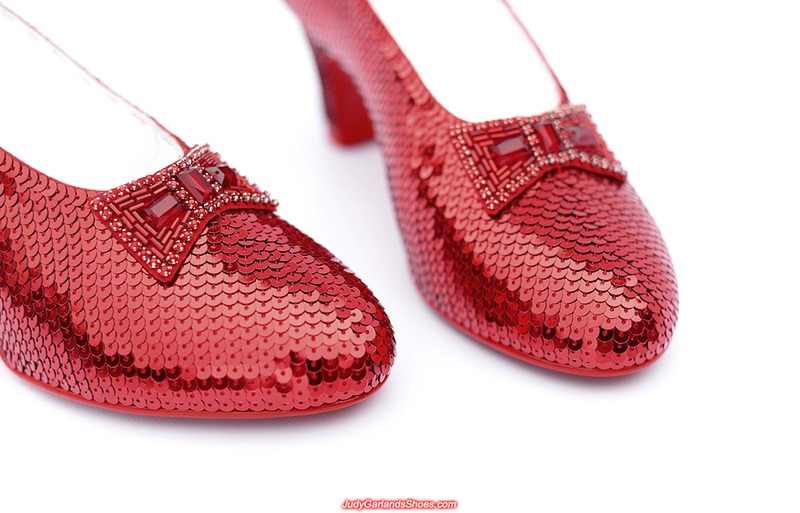 We are meticulous about everything we do with our high quality ruby slippers and she will look like a princess in this pair. 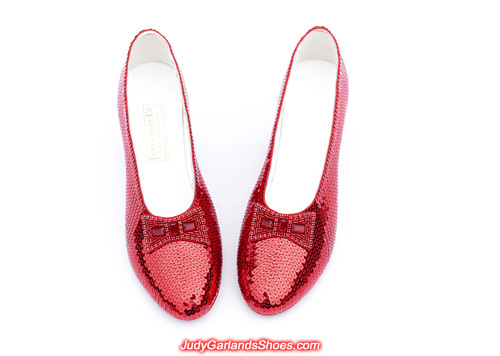 Hand sewing the sequins directly to the shoe takes more time and patience on a bigger shoe size than Judy Garland as Dorothy's size. 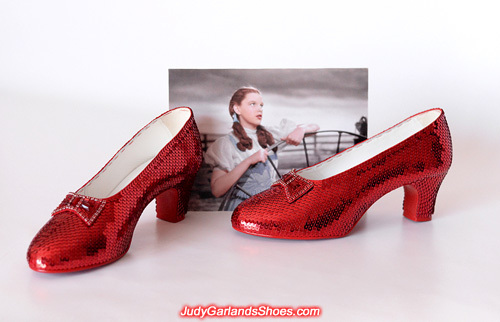 So far, so good with our final project in 2018 but there's still a lot of work to craft this beautiful wearable hand-sewn ruby slippers in custom size 8.5 women's US. 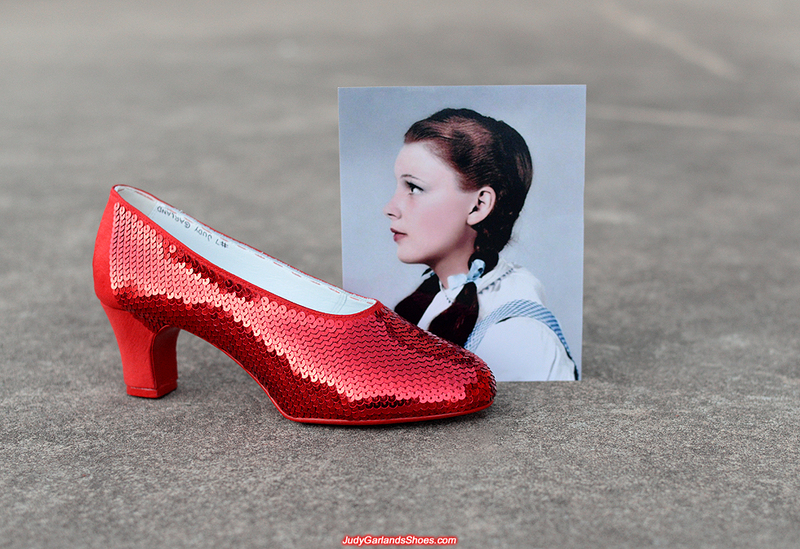 Judy Garland looked in great shape in The Wizard of Oz. The things the studio did to her worked, but being MGM's biggest child star required hard work and making sacrifices to play Dorothy for $500 per week. The right shoe is finished and it looks stunning and perfect. Now it's exactly the same job with the left shoe so we need to continue to stay focused on more sewing. $500 US dollars per week was a satisfactory amount of salary for Hollywood child stars in the 1930's. The three adult male actors who played the Scarecrow, Tin Man and Lion earned much more than Judy Garland's role as Dorothy. There wasn't any opportunity for Judy Garland to earn more than the agreed weekly salary which meant that MGM Studios overworked her as they pleased. 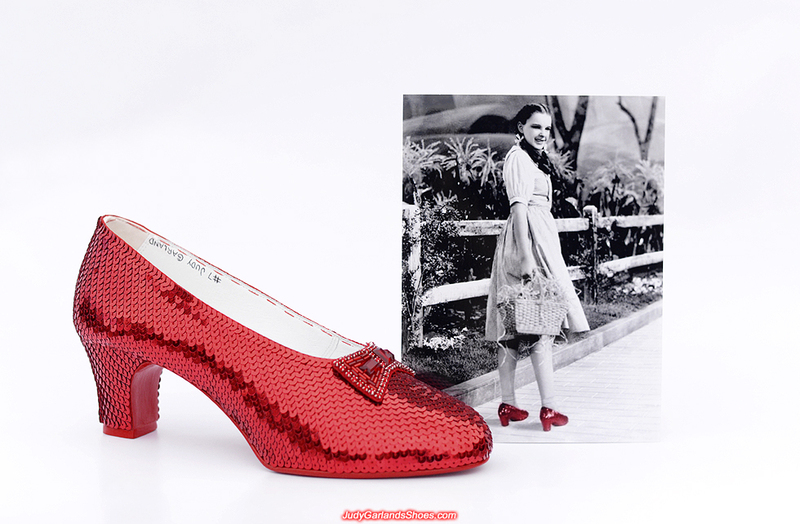 A great talent who was born in America, she was very beautiful as Dorothy and she had a beautiful singing voice. Our women's size 8.5 hand-sewn ruby slippers looks very stunning as we're on the home stretch with our final project in 2018. 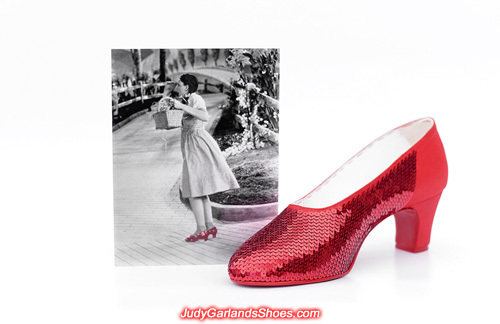 This pair of ruby slippers looks bigger in person, remember Judy Garland as Dorothy wore a size 5. We have finished an absolutely beautiful pair of size 8.5 women's US wearable hand-sewn ruby slippers. These will be heading off to Los Angeles, California and may their magic bring good luck to the new owner. 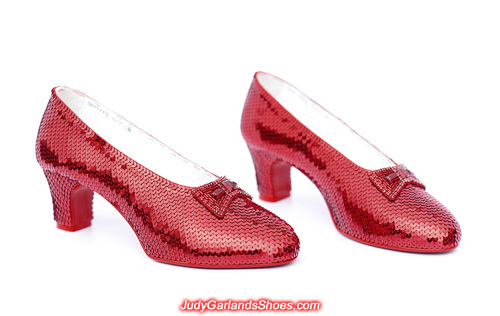 Another year has come and gone, and it has been a great joy but also very hard crafting authentic-looking ruby slippers for Judy Garland and The Wizard of Oz fans around the world. If you're a true fan and you still haven't purchased a pair, these amazing piece of art are a must have in your lifetime. Thank you very much for your support.